This unique small-tour experience will guide you to the oldest above-ground cemetery in the United States, St. Louis No.1. 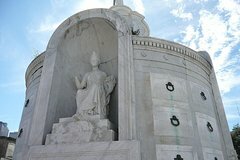 Learn about the hauntings, history, and unusual burial practices that make our cemetery one of a kind, and learn the scandalous history of its most-celebrated occupants, including voodoo priestess Marie Laveau, civil rights pioneer Homer Plessy, and that scandalous Creole Bernard de Marigny, as well as view the future tomb of Nicholas Cage! Learn about society tombs, stepped tombs, wall vaults, family burials and so much more, plus see where Easy Rider was filmed and why the church wasn't too happy about it! Departing from the old French Quarter, the original section of New Orleans, this tour will reveal the dark secrets and humble beginnings of New Orleans, discussing voodoo, hoodoo, and scandals, before taking you into a city of the dead like no other! You now must have a guide approved by the Archdiocese of New Orleans to visit St. Louis No.1. This walking tour will depart from P.J. 's Coffee House, conveniently located at 630 Chartres Street in the historic Upper Pontalba Building, just off Jackson Square. Your guide will lead you through the old French Quarter during the first half of the tour, stopping at various historical locations to explain the unique history of New Orleans. You will learn about the history, the hauntings, and the unique burial practices that make St. Louis No. 1 so unique. After a leisurely 7-block stroll, the tour will take a break at the Basin St. Visitor's Center, a converted railway depot, where guests can view exhibits and even a short film on the history of the railroads in New Orleans, while having an opportunity to use the restrooms and purchase refreshments. The tour will then enter St. Louis No. 1, just across the street, where your guide will explain the various types of tombs and the stories of the dead within. The tour will end at the cemetery gates, where your guide will be happy to answer questions and give directions to your next destination!